Having online marketing skills are extremely valuable today. There are a lot of places you can learn these skills, but not all of them will teach you anything of value, and there are also many scams. I have worked online for many years, have an income on my own websites, and work as a freelancer for several big online marketing agencies. In this article I will from my experience show you how to learn online marketing the best and most effective way, and also give you a secret tip about how you can earn while you learn online. What can online marketing skills be used for? Before getting to the best way to learn internet marketing, I just want to go into what these skills can be used for. The term itself used can differ from person to person. Sometimes it is called online marketing, sometimes digital marketing, and other times it is called internet marketing. I am using all the terms at times myself, but no matter which of these terms you in general hear, you can assume they are talking about the same thing – how to promote and communicate effectively through digital channels. You probably already have an idea about why you want to learn these skills, since you are on this page. But when I first started, I had no idea how many opportunities it could bring. I therefore want to mention some ways you can use online marketing skills, and maybe give you a few ideas. These ideas are not in prioritized order. More or less any company today need employees with some kind of online marketing skills. Without an online presence, a business today is more or less invisible. Therefore, you will find that it increases your chances of getting a good job significantly, if you have online marketing skills. This can be a job in more or less any kind of company, and it can also be in an online marketing agency, where you work as a consultant and help other businesses with their internet marketing. This is just one way to use online marketing skills, and it can be a good option, if you are looking for a permanent and steady job. There are however also many other opportunities, depending on your interests. If you would like to have your own local business, you can start your own online marketing agency. This of course takes a lot of work, and it usually takes some time to build up a constant flow of customers. It does however have a lot of potential, and many companies are looking to hire online marketing agencies to help them, as they do not have the skills themselves. Eventually this can grow big, and if you wish to, you can take it as far, as you want to – it will take hard work, but it is possible to create a good business this way. Many people are looking for help in this area, and it will likely not be less in the near future, so it can definitely be a great way to build a business, if this is what you are dreaming about. If you like to work on different projects but like the freedom to pick and choose yourself, you can start as an online marketing freelancer. This gives a lot of opportunities, and it can be done in many ways. You can for example work as a freelancer for digital agencies, you can work for different projects, or you can create a profile on one of the many online freelance portals to offer your services here. 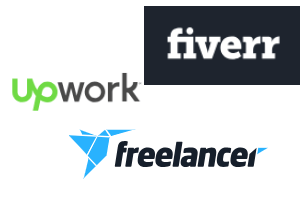 There are many freelance portals online. I am myself regularly working as a freelancer. I have for example worked as a freelancer for several big digital agencies that have hired me to do work for their clients – sometimes on more permanent basis and other times per project. This is a great way to make money, and it gives a lot of freedom. 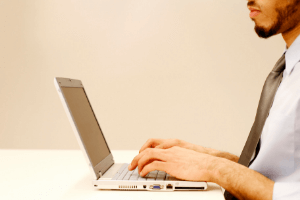 It is not always easy to find these freelance jobs, as there are many people that offer it. But if you start small, it will become easier and easier as you gain more experience and more references. If you already have a business, learning online marketing can help you a lot with the promotion of this. It does not really matter what kind of business you have, whether it is a local brick and mortar business, or something else. I have written a whole article about how to get customers for your local business through online marketing, you can read to get more details. Being involved in the marketing of your own business increases the chances of success in my experience. Some people just wish to hire others to do the promotion, and this can also give great results. 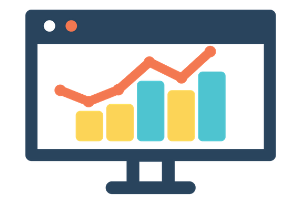 But having some kind of understanding of how internet marketing works, and how you can use this to promote your own business increase the chances of success. You are the expert and the one that knows the most about your business – being involved will bring more authenticity than just hiring someone else to do it. Therefore, it is great to have some online skills. Even if you hire others, it is good to be able to ask the right questions and keep an eye on them. If you want, what I see as the ultimate freedom, starting your own online income can be a great option. This will allow you to work completely on your own terms, and work where and when you want to. This takes a lot of focus, but if you use your skills to build a business like this and can keep yourself motivated, you can have this income no matter where you are, and you will even be able to have income when you take some time off, as it will continue to bring income even the hours when you do not work on it. 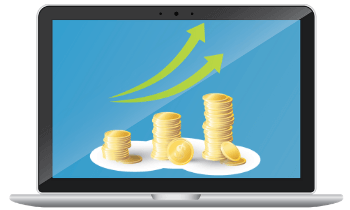 A way to create an income like this can for example be through affiliate marketing, where you promote products and earn commissions without having to own and store the products. This is just one of the ways you can create an income online for yourself. Later I will expand more on this option. Can anybody learn internet marketing? You might think that it sounds great with the opportunities you get, if you know online marketing, but are worried about the kind of technical skills it takes to learn online marketing. What kind of skills you need depends a lot on the route you want to take. No matter what, it is of course an advantage, if you know the basics of using a computer. But in general there are no particular skills you need. If you are willing to work hard and are open to learn new skills, it is possible to learn online marketing more or less no matter your previous experiences and background. I have seen people with no technical skills and with no previous experience with online marketing at all work hard and spend a lot of time learning and testing. This has made them successful, and I have seen how people have been able to build their own full-time online income this way. So if you are determined and willing to make an effort, you do not have to be worried about your skills before you start. What is the best way to learn online marketing? Now you know a bit more about why it is great to have online marketing skills. So let’s now look at how you can learn these skills the best way. There are MANY online courses online that promises to teach you this. There are also many free courses that teach you a few basic things, as a way to for example promote their own online business tool. If you just want to learn one specific skill, some of these courses can be great. I have myself for example taken a few course through Udemy. This can good, if you for example just want to learn more about Facebook ads, or any other particular skill. I have however found that most online courses are not very hands-on, and often they do not take you through everything step-by-step. This does not mean you cannot learn from them, because you definitely can, and I have learned from single courses like this myself. But if you want the big overview, and learn how to do it all step-by-step and see how all aspects of internet marketing like for example SEO, content, social media, email marketing, building websites, etc. are connected, and how you can use them in combination with each other, there are not many courses that I have found. In addition to this, you need to be aware of the many online scams. Often these promise to teach you the secrets to become rich online and learn internet marketing without having to do any work. Programs that make claims like this are usually scams and are just trying to lure money from you. So it can be difficult to find the good ways to learn internet marketing, if you do not know what to look for, and how to find the good courses. Below, I will therefore share my preferred way with you, and one I have had a lot of success with myself. I have tested many online courses, and I am continuously learning new skills to keep up-to-date. I have had a lot of success on a learning platform called Wealthy Affiliate. It is an online community with step-by-step training about how to build an online income. It has great training, a lot of support, great tools to make your learning and results more efficient, and it gives very good value for money. The reason I think this is the best way to learn internet marketing is not only the great training and support, but also because I have seen the results myself. And I have experienced how it makes it possible to earn while you learn online. The training there is focused on teaching you how to build your own online income. The skills you learn while doing this and by going through the training, is however skills you can use for all the opportunities I mentioned earlier in this article. It is very hands-on and takes you through everything step-by-step. I have for example experienced how I have been able to build my own websites and have an income from these. At the same time, I have learned some very valuable skills that have made it possible for me to be offered more freelance jobs than I have time to say yes to. So if you want to learn all there is to know about online marketing, how it is all connected, and at the same time have the opportunity to earn money while learning this, if you wish to, then Wealthy Affiliate is without a doubt my top recommendation. You can even get started for free, and get you first 10 lessons for free. If you join through the link below, we will also automatically be connected after you join, and I will then be able to help you with any questions, and guide you every step of the way. Learning online marketing gives great opportunities. Once you have the skills, you can take it in any direction you want. Whether you are looking to get a new full-time job, work as a freelancer, promote an existing business, or create your own online income, it is great skills to have. There are many ways you can learn this online. However, most of them will not show you how all aspects of internet marketing works together. If this is what you are interested in and are interested in earning while you learn, then the best way in my experience is the platform mentioned above. So now it is up to you to find out what your goals are, and what kind of learning method you prefer. 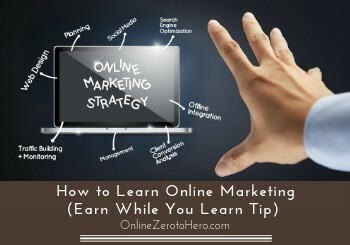 No matter what, learning online marketing will definitely be great skills to have. If you have any comments, questions, or have any experiences with the best ways to learn online marketing yourself, I would love to hear from you in a comment below. The earning while you learn tip is the best tip ever when implementing Wealthy Affiliate. The entire platform is amazing and it offers so much clarity and financial stability. I must say that online marketing has made a major difference in my life and I am forever thankful. Great article! Thanks for sharing your experiences Courtney. Glad to hear you are also enjoying and benefiting from having learned online marketing. I love your explanation on the various ways we can earn online through online marketing. For me the wealthy affiliate community is still the best. I keep telling my friend about the platform and the various packages they offer. But I’m having issues, my niche is about children health and nutrition and sometimes I normally promote children products and food but since, I haven’t received any income, I feel that people don’t usually get children foods online because of safety they prefer getting it around which is faster and more convenient. About your niche, I am sure there are people that buy children products online. With an affiliate marketing website it can however take quite a lot of traffic to get sales, and organic traffic can take time to build up. But with more traffic sales will also come. Just keep producing valuable content for visitors your site, keep following the training at WA, and keep learning – then the sales will definitely come. Wish you all the best, and if you ever need any help or have questions feel free to come back and ask. Oh, thank you so much for the recommendation about the Wealthy Affiliate program. I’ve heard of it before from a friend of mine, and he loved it, so when I saw you recommended it, too, and that there’s a free trial, I thought I had to give it a try. Wow, I’m already loving it, so thank you again. I am really excited about all this program has to offer. Great to hear Babs. And thanks for sharing your experience.